Two years ago Brant County proposed selling a series of county-owned buildings that they deemed “surplus.” According to the county, selling these eight buildings would save the county over $3 million over the next fifteen years. The county would save on operating and capital costs, especially the costs of provincially mandated accessibility up-grades required for all public buildings. Brant County is a mostly rural county with an overall population of approximately 36,000. The largest community and county seat is Paris, Ontario, a scenic community on the Grand River with a population of 8,800. The eight buildings that Brant County planned to sell are scattered throughout the county, spread throughout the small rural communities. The Harley/Burford Township Hall, built ca. 1904, was used for a variety of purposes: weddings, dances, community celebrations, township meetings, community functions, and most recently as the home of the Burford Township Historical Society. The St. George Memorial Hall, located in downtown St. George, was built in 1855, and is dedicated as a memorial to local war veterans. The building currently houses the South Dumfries Historical Society Museum & Archives. Also in St. George is the St. George Old School, built ca. 1893 as a public school, and recently used as a day care. Community centres in Onondaga (built ca. 1874), Bethel (built ca. 1844), Pine Grove and Howell (ca.1874) and Northfield (ca.1900), were also on the surplus list. The last building, the Langford School, built in 1886, began as a one-room school house for the surrounding community, and in 1964, became a community centre, and later housed a day care. All these “surplus” buildings served the local communities in one use or another: school house, community centre, daycare, township hall, local museum and archives. They served as significant meeting places for these rural communities. They helped to create and maintain a sense of community in areas with little centralized infrastructure and facilities. Longtime residents of these communities, as well as the organizations currently using these buildings quickly voiced their concerns with the county’s plan to sell these buildings. In St. George, community members accused the county of disrespecting the war veterans to whom the St. George Memorial Hall is dedicated. Others expressed concern that without a gathering place for residents, the rural areas would lose their sense of community. And lose their history. The South Dumfries Memorial Hall and Harley/Burford Township Hall house significant collections of local history artifacts and archives, maintained by volunteer-run historical societies. Members of the Burford Township Historical Society feared that without the building to house their collection, their valuable local history could be lost. Supporters of the Harley Museum vowed to fight the county over the sale of their building. 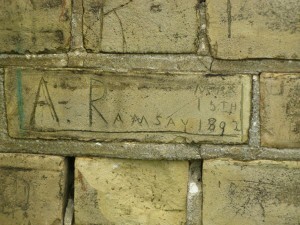 Etchings on the exterior bricks of Langford School made by past students. Supporters of the Langford School also began to organize and formulate plans to save the old school. For nearly a century the handsome brick one-room building served as the local school for children from the area around the village of Langford. After the school closed in 1964, the building was used as a community centre for the area’s residents. Throughout its history the Langford School was also the meeting place for the local Women’s Institute, which among other activities faithfully preserved the history of the local families. 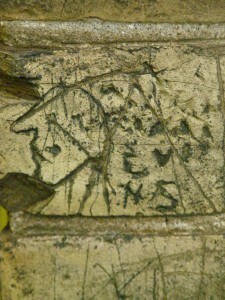 The history of these students and families is etched into the exterior bricks of the old one-room school house. For the residents of Langford, the bricks of the Langford School were a significant historical record of the community. They feared that if this building was sold by Brant County, the land would likely be bought up by foreign landholders that have been purchasing huge tracts of farmland in the area for development. If this were the case, the old Langford School would like be demolished to make room for new subdivisions. Supporters of the Langford School created a group, Friends of Langford School, and a Facebook group. They worked with a non-profit group in the area, Sustainable Brant, to manage the building, and approached Brant County for a lease on Langford School. The Friends of Langford School also consulted with the Ontario Heritage Trust and approached the Brant County Municipal Heritage Committee about designating the old school as a heritage building. They proposed re-opening the Langford School as a community centre, and operated as a non-profit organization. After months of negotiations with the Brant County council recently voted to give the Friends of Langford School a five-year lease on the building, allowing the group to pursue grants from organizations like the Ontario Trillium Foundation, for capital expenses and program funding. With the City of Brantford’s decision to demolish 41 buildings in its historic downtown last year, the decision to save Langford School is very good news for those who feel that preserving built heritage is an important part of preserving local history. For now the bricks of Langford School will remain to tell the stories of all the students that spent there.